On our final day in Hawaii, we had to think of something to do until our flight left at 9:40 pm. Since we had to check out of our hotel in the morning, we were quite limited in our options so we decided to take a tour around the whole island. Groupon hooked us up with a Circle Island Tour from VIP Transportation. We got picked up bright and early and spent the day exploring the Hawaiian lifestyle outside of Waikiki. 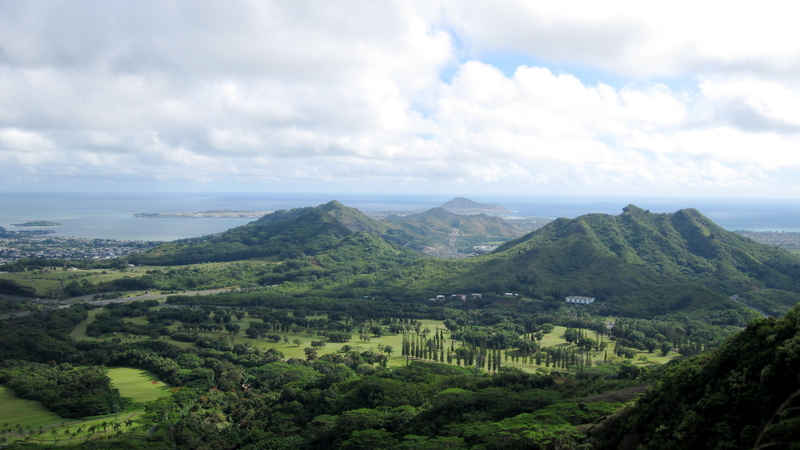 Our first stop was the Nuuanu Pali lookout, which overlooks the 985 foot cliffs of the Koolau Mountain Range. It is by far the best view in O’ahu and also happens to be the site that King Kamehameha and his warriors defeated the O’ahu armies in 1795 to unite the Hawaiian islands by pushing them off the cliffs. That would be quite a way to go. Our favourite part of the spot was probably the incredible winds that threatened to take us over the cliffs as well… apparently we were there on a rather calm day. 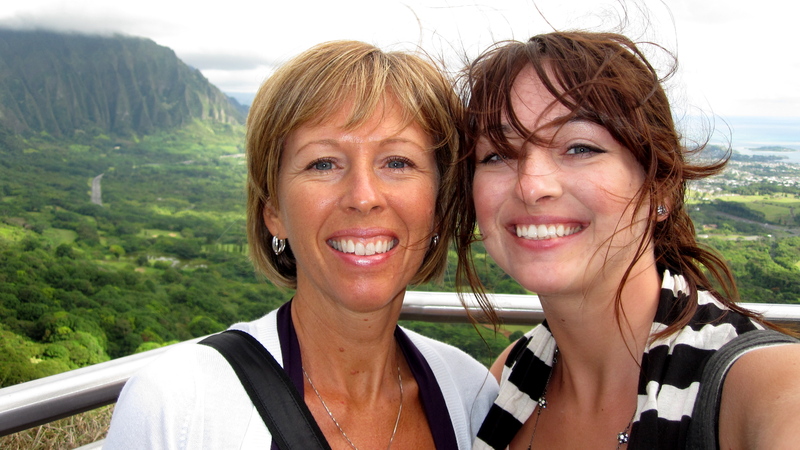 Trying to keep the hair off of my face long enough for a photo… very difficult. After the lookout it was on to the Dole Plantation for the ultimate pineapple experience. 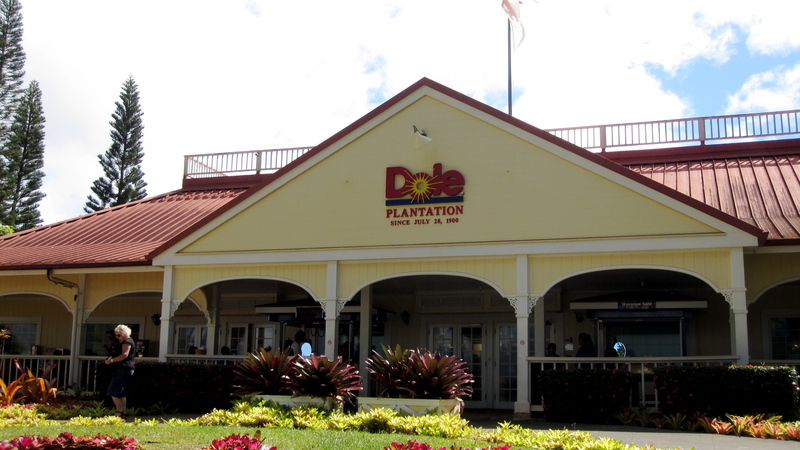 We highly recommend the Dole Whip (soft serve ice cream)! 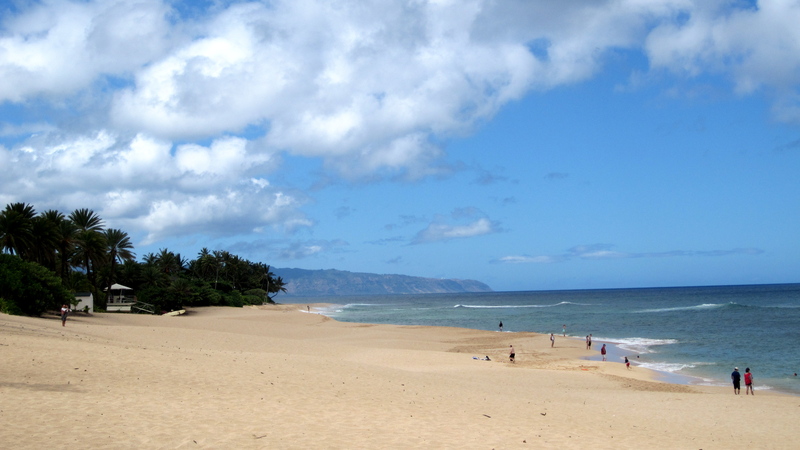 After that we kept cruising to the North Shore where we drove by the infamous Bonzai Pipeline where you can find the best surfing in the world from November to March. We kept driving until we hit another popular surf spot called Sunset Beach. Unfortunately the waves are quite small this time of year, but the beach was still beautiful! Our last stop before lunch was in the town of Laie to see the Morman Temple. That’s right… you heard me… Morman Temple. To me, Hawaii seems like the most random place for a Morman Temple, but then again, Brigham Young University is right next door so I guess it makes sense. 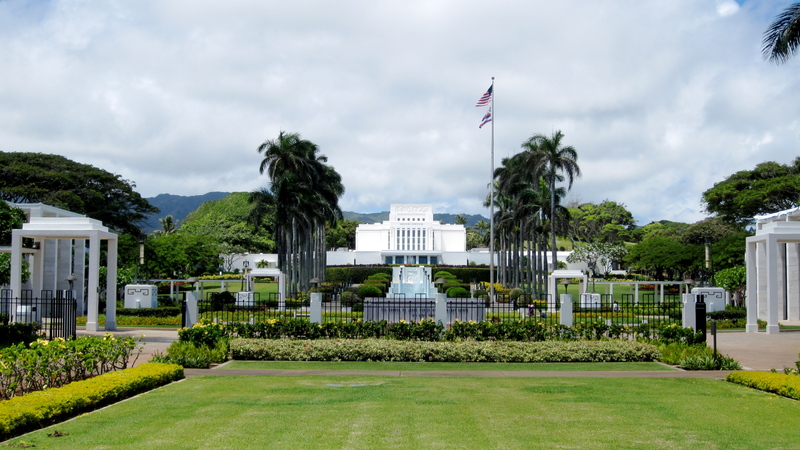 Laie Hawaii Temple was the first LDS Church temple built outside of the continental United States. The temple is also the oldest to operate outside of Utah, and the fifth-oldest LDS temple still in operation. I’d also like to suggest that it’s the most beautiful… I mean seriously? There’s a reason they call it the Taj Mahal of the Pacific. 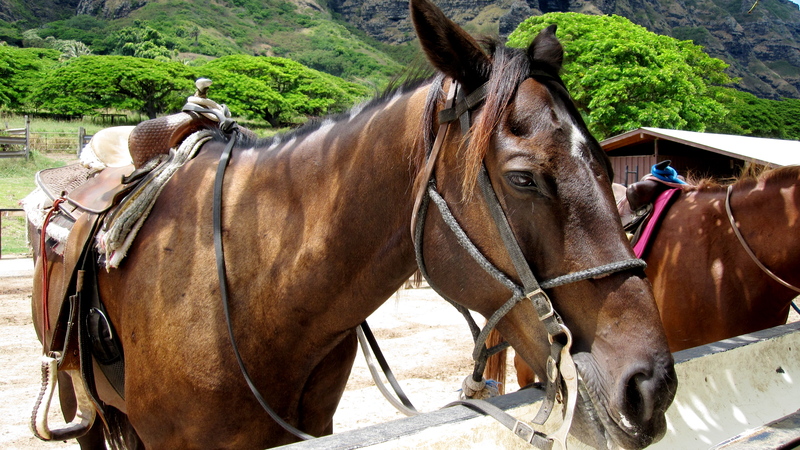 For lunch we stopped at Kualoa Ranch located in the Ka’a’awa Valley. We were given the choice of eating on the back lanai with the view of the mountains or on the front lanai with a view of the ocean… it was a tough decision but we opted for the mountains. 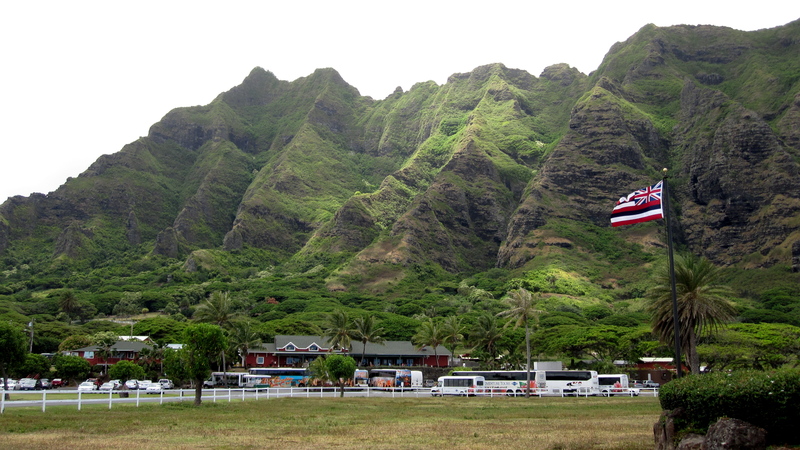 This valley is actually best known as a film location for productions such as Jurassic Park, Mighty Joe Young, Pearl Harbor, Windtalkers, Godzilla, and Lost. After lunch we wandered around the ranch, pet the horses, and ended up at the ocean. 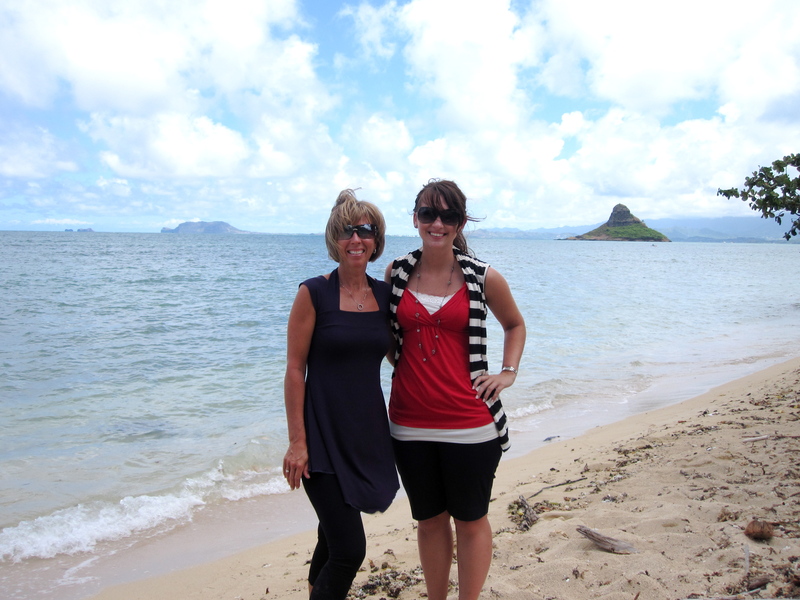 We finally found the perfect place to get a picture of the island known as Chinaman’s Hat for obvious reasons. The next stop was definitely my favourite. We went to Tropical Macadamia Nut Farms, which is a macadamia outlet factory. We met the owner of the whole facility and thanked him profusely for all of the free samples. You can tell that this was my favourite stop since I took so few pictures. I was too distracted by the cinnamon glazed macadamia nuts, the macadamia nut Kona coffee samples, and the freshly cut coconut that I couldn’t be bothered to take pictures. We definitely came home with some treats. The last two stops were simple and beautiful. We visited the Halona Blow Hole, which wasn’t very exciting due to the low ocean surge at the time. But just to the left was the Halona Cove where the kiss of Deborah Kerr and Burt Lancaster took place in the film From Here to Eternity. I have to admit that I haven’t seen that one, but Drew Barrymore and Adam Sandler also shared a kiss there in the movie 50 First Dates. I can definitely see why. Access to the secluded beach is very difficult and it certainly has a cinematic feel. Maybe next time, I’ll be brave enough to climb down. 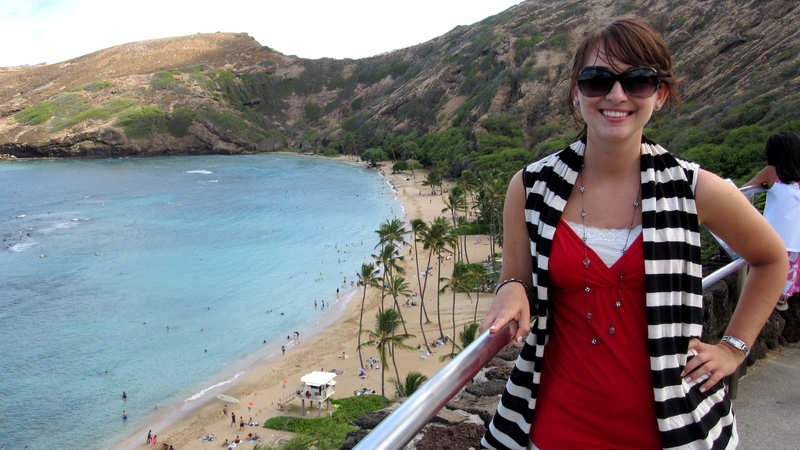 And the last stop of the day was Hanauma Bay, which is a marine embayment formed within a volcanic cone. 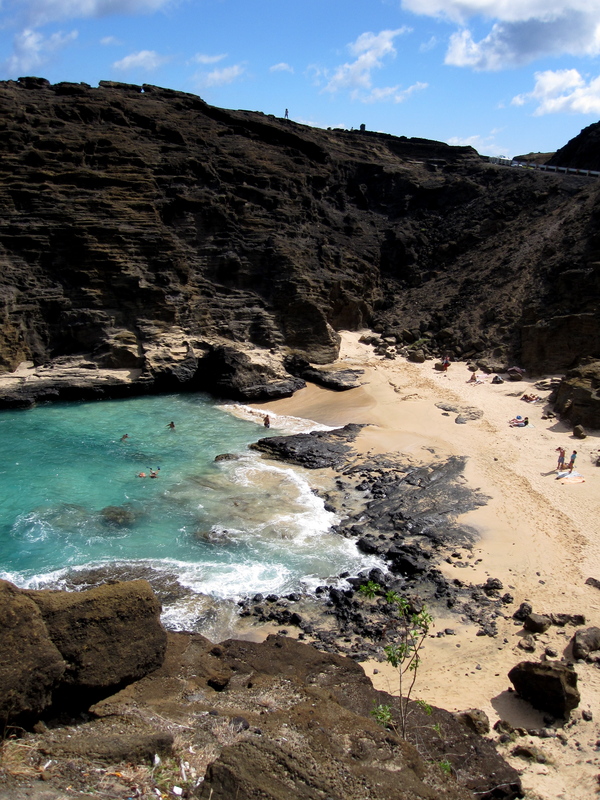 It has some amazing coral and a vast assortment of tropical fish, which makes this a prime snorkeling location. Unfortunately, the bay has suffered some to do overuse and now it is highly regulated, but for a small fee and some conversation education, you can still spend a highly enjoyable day down by the bay. I had a marvelous time in Hawaii and I can’t wait to return and maybe check out some of the other islands in the future!